بشارت, محمد علی, رامش, سمیه. (1397). پیش بینی میزان شدت بیماری قلبی عروقی بر اساس تاب آوری، سلامت معنوی و حمایت اجتماعی. 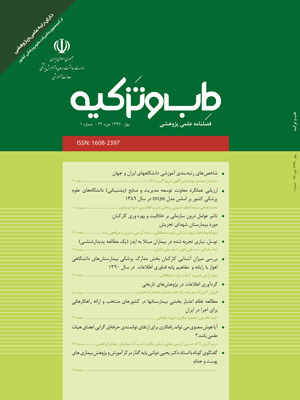 طب و تزکیه, 27(ویژنامه علوم انسانی سلامت), 34-45. محمد علی بشارت; سمیه رامش. "پیش بینی میزان شدت بیماری قلبی عروقی بر اساس تاب آوری، سلامت معنوی و حمایت اجتماعی". طب و تزکیه, 27, ویژنامه علوم انسانی سلامت, 1397, 34-45. بشارت, محمد علی, رامش, سمیه. (1397). 'پیش بینی میزان شدت بیماری قلبی عروقی بر اساس تاب آوری، سلامت معنوی و حمایت اجتماعی', طب و تزکیه, 27(ویژنامه علوم انسانی سلامت), pp. 34-45. بشارت, محمد علی, رامش, سمیه. پیش بینی میزان شدت بیماری قلبی عروقی بر اساس تاب آوری، سلامت معنوی و حمایت اجتماعی. طب و تزکیه, 1397; 27(ویژنامه علوم انسانی سلامت): 34-45. زمینه و هدف: عوامل زیستی و روانی در ابتلا به بیماری قلبی عروقی نقش دارند. پژوهش حاضر با هدف بررسی نقش تاب آوری، سلامت معنوی و حمایت اجتماعی در پیش بینی شدت بیماری قلبی عروقی انجام شد. روش بررسی: تعداد 327 بیمار مبتلا به تنگی عروق کرونر (138 زن، 189 مرد) در این پژوهش شرکت کردند. از مقیاس تاب-آوری کانرـ دیویدسون(CD- RISC) ، مقیاس بهزیستی معنوی (SWBS) و مقیاس چند بعدی حمایت اجتماعی ادراک شده (MSPSS) و نمره گنزینی به عنوان سنجش میزان شدت بیماری قلبی عروقی برای جمع آوری داده ها استفاده شد. جهت تحلیل داده‌ها از روش آماری همبستگی پیرسون و رگرسیون گام به گام استفاده شد. یافته‌ها: نتایج پژوهش نشان داد که بین تاب آوری، سلامت معنوی و حمایت اجتماعی با شدت بیماری قلبی عروقی همبستگی منفی معنادار وجود دارد؛ بدین معنی که با افزایش تاب آوری، سلامت معنوی و حمایت اجتماعی شدت بیماری قلبی عروقی کاهش می‌یابد. در تحلیل رگرسیون پس از کنترل ریسک فاکتورها، از سه متغیر تحلیل شده، تاب آوری و سلامت معنوی توان پیش بینی شدت بیماری قلبی عروقی را داشتند و حمایت اجتماعی چنین توانی را نداشت؛ به طوری که تاب آوری 28% و تاب آوری به همراه سلامت معنوی 35% از واریانس شدت بیماری قلبی عروقی را تبیین کردند (01/0p <). نتیجه گیری: بر اساس یافته های این پژوهش، می توان نتیجه گرفت که در کنار عوامل زیستی، توجه به نقش عوامل روانشناختی تاب آوری، سلامت معنوی و حمایت اجتماعی در مداخلات پیشگیرانه و درمانی مرتبط با بیماریهای قلبی عروقی ضرورت خاص دارد. Background and Aim: Biological and psychological factors are associated with cardiovascular disease. The purpose of this study was to investigate the role of resiliency, spiritual well-being and social support in predicting the severity of cardiovascular disease. Materials and Methods: A total of 327 patients with coronary artery stenosis (138 women, 189 men) participated in this study. The Connor-Davidson Resilience Scale (CD-RISC), the Spiritual Well Being Scale (SWBS), and the Multidimensional Perceived Social Support (MSPSS) Scale and Geszin score were used to measure the severity of cardiovascular disease in order to collect data. Data were analyzed using Pearson correlation and stepwise regression. Results: The results of the study showed that there is a significant negative correlation between resilience, spiritual well-being and social support with the severity of cardiovascular disease; that is, with increasing resilience, spiritual well-being and social support, the severity of cardiovascular disease decreases . In regression analysis after controlling risk factors, three of the analyzed variables, resiliency and spiritual well-being had the ability to predict the severity of cardiovascular disease, and social support did not have such an ability, with a resiliency of 28% and resiliency plus spiritual well-being explained 35% of the severity of cardiovascular disease severity (p <0.01). Conclusion: Based on the findings of this research, it can be concluded that along with the biological factors, consideration of the role of resilience, spiritual well-being and social support psychological factors in preventive and therapeutic interventions related to cardiovascular diseases is a special necessity. Oguoma VM, Nwose EU, Ulasi II, Akintunde AA, Chukwukelu EE, Bwititi PT, et al. Cardiovascular disease risk factors in a Nigerian population with impaired fasting blood glucose level and diabetes mellitus. BMC public health. 2017 Dec;17(1):36. Sabatine MS, Giugliano RP, Keech AC, Honarpour N, Wiviott SD, Murphy SA, et al. Evolocumab and clinical outcomes in patients with cardiovascular disease. New England Journal of Medicine. 2017 May 4;376(18):1713-22. Williams JE, Mosley Jr TH, Kop WJ, Couper DJ, Welch VL, Rosamond WD. Vital exhaustion as a risk factor for adverse cardiac events (from the Atherosclerosis Risk In Communities [ARIC] study). The American journal of cardiology. 2010 Jun 15;105(12):1661-5. Tomlinson LA, Cockcroft JR. Post-traumatic stress disorder: breaking hearts. Eur Heart J. 2011 Mar 1;32:668-9. Tseng WC. A meta-analysis of effect generalizations of protective factors of resilience. Journal of Counseling & Guidance. 2006;14:1-35. Bonanno GA. Loss, trauma, and human resilience: Have we underestimated the human capacity to thrive after extremely aversive events?. American psychologist. 2004 Jan;59(1):20. Satici SA. Psychological vulnerability, resilience, and subjective well-being: The mediating role of hope. Personality and Individual Differences. 2016 Nov 1;102:68-73. Bergh C, Udumyan R, Fall K, Almroth H, Montgomery S. Stress resilience and physical fitness in adolescence and risk of coronary heart disease in middle age. Heart. 2015 Feb 10:heartjnl-2014. Sharpley CF, Bitsika V, Jesulola E, Fitzpatrick K, Agnew LL. The association between aspects of psychological resilience and subtypes of depression: implications for focussed clinical treatment models. International journal of psychiatry in clinical practice. 2016 Jul 2;20(3):151-6. He F, Cao R, Feng Z, Guan H, Peng J. The impacts of dispositional optimism and psychological resilience on the subjective well-being of burn patients: A structural equation modelling analysis. PloS one. 2013 Dec 17;8(12):e82939. Koenig HG. Religion, spirituality, and medicine: Application to clinical practice. Jama. 2000 Oct 4;284(13):1708-. Renetzky LF. The fourth dimension: applications to the social services. 1977. Young C, Koopsen C. Spirituality, health, and healing: An integrative approach. Jones & Bartlett Publishers; 2010 Aug 15. Unantenne N, Warren N, Canaway R, Manderson L. The strength to cope: Spirituality and faith in chronic disease. Journal of religion and health. 2013 Dec 1;52(4):1147-61. Taylor SE. Social support: A review. The handbook of health psychology. 2011 Mar 15;189:214. Wong ST, Wu A, Gregorich S, Pérez-Stable EJ. What type of social support influences self-reported physical and mental health among older women?. Journal of aging and health. 2014 Jun;26(4):663-78. Cacioppo JT, Hawkley LC, Thisted RA. Perceived social isolation makes me sad: 5-year cross-lagged analyses of loneliness and depressive symptomatology in the Chicago Health, Aging, and Social Relations Study. Psychology and aging. 2010 Jun;25(2):453. Cacioppo JT, Hawkley LC, Crawford LE, Ernst JM, Burleson MH, Kowalewski RB, Malarkey WB, Van Cauter E, Berntson GG. Loneliness and health: Potential mechanisms. Psychosomatic medicine. 2002 May 1;64(3):407-17. Birditt K, Antonucci TC. Life sustaining irritations? Relationship quality and mortality in the context of chronic illness. Social Science & Medicine. 2008 Oct 1;67(8):1291-9. Thurston RC, Kubzansky LD. Women, loneliness, and incident coronary heart disease. Psychosomatic medicine. 2009 Oct;71(8):836. Besharat MA. Reliability and Validity of the 28-item Form of Mental Health Scale in Iranian Population. Journal of Legal Medicine. 2009, 54, 91-87. Zigmond AS, Snaith RP. The hospital anxiety and depression scale. Acta psychiatrica scandinavica. 1983 Jun 1;67(6):361-70. Eysenck SB, Eysenck HJ, Barrett P. A revised version of the psychoticism scale. Personality and individual differences. 1985 Jan 1;6(1):21-9. Paloutzian RF, Ellison CW. Loneliness, spiritual well-being and the quality of life In Peplau LA & Perlman D.(Eds. ), Loneliness: A sourcebook of current theory, research and therapy (pp. 224–237). Zimet GD, Dahlem NW, Zimet SG, Farley GK. The multidimensional scale of perceived social support. Journal of personality assessment. 1988 Mar 1;52(1):30-41. Bruwer B, Emsley R, Kidd M, Lochner C, Seedat S. Psychometric properties of the Multidimensional Scale of Perceived Social Support in youth. Comprehensive psychiatry. 2008 Apr 30;49(2):195-201. Martin A. Motivation and academic resilience: Developing a model for student enhancement. Australian journal of education. 2002 Apr;46(1):34-49. Felten BS, Hall JM. Conceptualizing resilience in women older than 85. Journal of Gerontological Nursing. 2001 Nov 1;27(11):46-53. Arrogante O, Aparicio-Zaldivar E. Burnout and health among critical care professionals: The mediational role of resilience. Intensive and Critical Care Nursing. 2017 Oct 1;42:110-5. Ong AD, Zautra AJ, Reid MC. Psychological resilience predicts decreases in pain catastrophizing through positive emotions. Psychology and aging. 2010 Sep;25(3):516. Cohn MA, Fredrickson BL, Brown SL, Mikels JA, Conway AM. Happiness unpacked: positive emotions increase life satisfaction by building resilience. Emotion. 2009 Jun;9(3):361. Ai AL, Hopp F, Tice TN, Koenig H. Existential relatedness in light of eudemonic well-being and religious coping among middle-aged and older cardiac patients. Journal of health psychology. 2013 Mar;18(3):368-82. Phelps AC, Maciejewski PK, Nilsson M, Balboni TA, Wright AA, Paulk ME, Trice E, Schrag D, Peteet JR, Block SD, Prigerson HG. Religious coping and use of intensive life-prolonging care near death in patients with advanced cancer. Jama. 2009 Mar 18;301(11):1140-7. Tartaro J, Luecken LJ, Gunn HE. Exploring heart and soul: effects of religiosity/spirituality and gender on blood pressure and cortisol stress responses. Journal of Health Psychology. 2005 Dec;10(6):753-66. Roomaney R, Kagee A. Coping strategies employed by women with endometriosis in a public health-care setting. Journal of health psychology. 2016 Oct;21(10):2259-68. McCullough ME, Willoughby BL. Religion, self-regulation, and self-control: Associations, explanations, and implications. Psychological bulletin. 2009 Jan;135(1):69. Piko BF, Brassai L. A reason to eat healthy: The role of meaning in life in maintaining homeostasis in modern society. Health psychology open. 2016 Feb 23;3(1):2055102916634360. Thong MS, Kaptein AA, Krediet RT, Boeschoten EW, Dekker FW. Social support predicts survival in dialysis patients. Nephrology Dialysis Transplantation. 2006 Dec 12;22(3):845-50. Holanda CM, Andrade FL, Bezerra MA, Nascimento JP, Neves RD, Alves SB, Ribeiro KS. Support networks and people with physical disabilities: social inclusion and access to health services. Ciência & Saúde Coletiva. 2015;20:175-84. Holt-Lunstad J, Smith TB, Layton JB. Social relationships and mortality risk: a meta-analytic review. PLoS medicine. 2010 Jul 27;7(7):e1000316. Murphy BM, Elliott PC, Le Grande MR, Higgins RO, Ernest CS, Goble AJ, et al. Living alone predicts 30-day hospital readmission after coronary artery bypass graft surgery. European Journal of Cardiovascular Prevention & Rehabilitation. 2008 Apr;15(2):210-5. Cohen S. Social relationships and health. American psychologist. 2004 Nov;59(8):676. Hawkley LC, Cacioppo JT. Loneliness matters: a theoretical and empirical review of consequences and mechanisms. Annals of behavioral medicine. 2010 Jul 22;40(2):218-27.